Whether you're using Microsoft Azure SQL Database for your SaaS business, enterprise production, or development and testing, under- or over-provisioning resources can mean either a poor user experience or wasted budget. 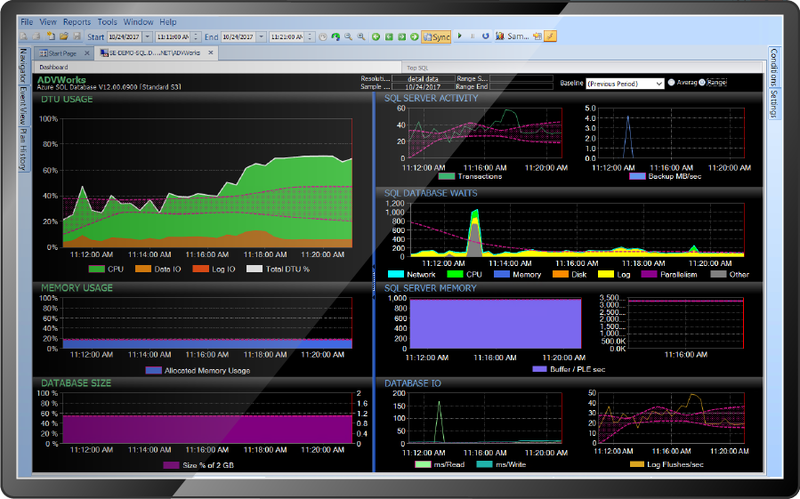 DB Sentry helps you monitor performance metrics, including DTU usage, and be notified of events occurring on your system. DB Sentry gives you the ability to distinguish consistent performance patterns from anomalies, which is critical to ensuring your data platform delivers optimal performance for the end users of your applications. With DB Sentry Azure SQL Database monitoring, you can stop playing the guessing game. Quickly discover and address performance problems across your Azure database environment. See your DTU usage, database size, memory usage, SQL Waits, and more. When you pay for the data system resources you use, neither overestimating usage nor under-provisioning is a viable option. DB Sentry helps you optimize performance by providing metrics you can use to better forecast resource allocation based on utilization. Using DB Sentry within the SentryOne platform to monitor your Azure SQL Database gives you the ability to see transactions per second, diagnose performance problems with TopSQL, and optimize the data platform with Plan Explorer. DB Sentry gives you everything you need to keep Azure SQL Database running at peak performance. How many databases to quote?